"Call 508.833.3182 for your free demo." 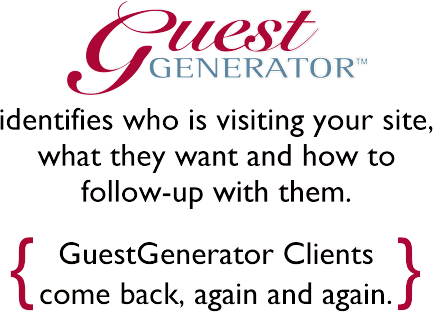 Lead Generation & Follow-Up. 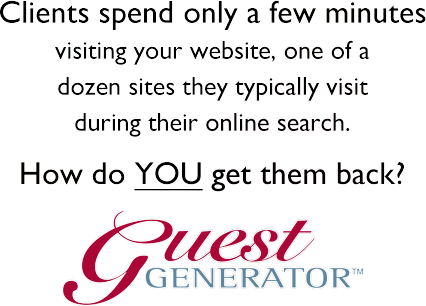 Multiply the number of online leads generated from your existing website. 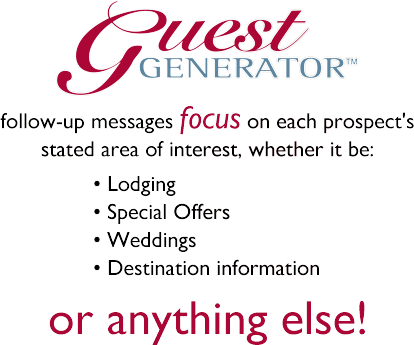 GuestGenerator follows-up each lead, pre-selling you property on its unique strengths. 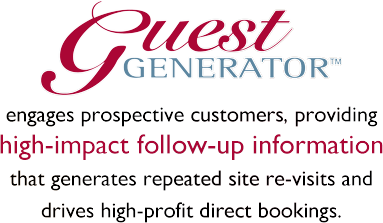 Drive more hi-profit, no-cost direct bookings. Follow-up works! Incentive Booking. 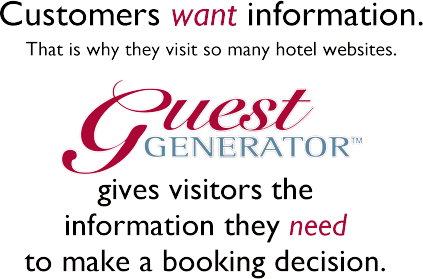 Book more of those recent inquirers who remain ‘undecided’ by automatically following-up and offering a no-cost/low-cost booking incentive. Sometimes it just takes a little nudge. Market Intelligence. Win more. Lose less. Get actionable market intelligence detailing which property and destination each prospect booked and why. Get the facts, not only from those who booked but also from those who did not. Rate Quote. PRQ delivers the personalized rate and availability information customers want, from an online source they can trust – your front desk - before committing to a reservation: and its in writing, so they can be sure. PRQ pre-sells your property too, driving more bookings. Destination Marketing. Nearly half of all visitors to your website choose to stay at a completely different destination. Online Concierge sells the destination by branding the best third-party destination content as your own. Lead Capture and Follow-Up. Don’t hang up – Follow-up! Designed specifically for busy front desks/call centers, FrontDesk Follow-up enables quick capture and follow-up to interested phone prospects. FrontDesk Follow-up gets the booking! Lead Automation. Save time and money with automatic follow-up for leads originating from third-party sources, such as destination sites and online directories. Grow your list without the work. Lead Generator. Build your client marketing list much faster. Our enhanced tools multiply list signups compared with traditional ‘Contact Us’ and ‘Join Our Email List’ forms.